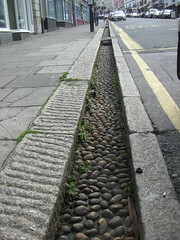 The curb stones on the streets of Heltson are made of local granite, the gutters are deep and floored with local cobbles. These gutters can both cope with the not insubstantial rainfall of the local climate, they can look beautiful too. This scribble was published on Sunday, July 19th, 2009. You can follow any banter on this scribble with the RSS 2.0 feed. You can share your inspired musings after typing the anti spam word near the bottom of the page. But no Pinging because its too naughty. It’s the thickness of the granite walls that gets me. Proper walls. That picture actually looks nice. The gutter compliments the surrounding scenery as does the surrounding scenery compliment the gutter. Unfortunately, you will probably never see something like that in the US. About the second or third time someone twisted their ankle in one of those things, the lawsuits would convince the city to get rid of such a gutter system. James, I’ve gotten my car stuck in rural drainage ditches. Can I get the county to install proper storm drains?